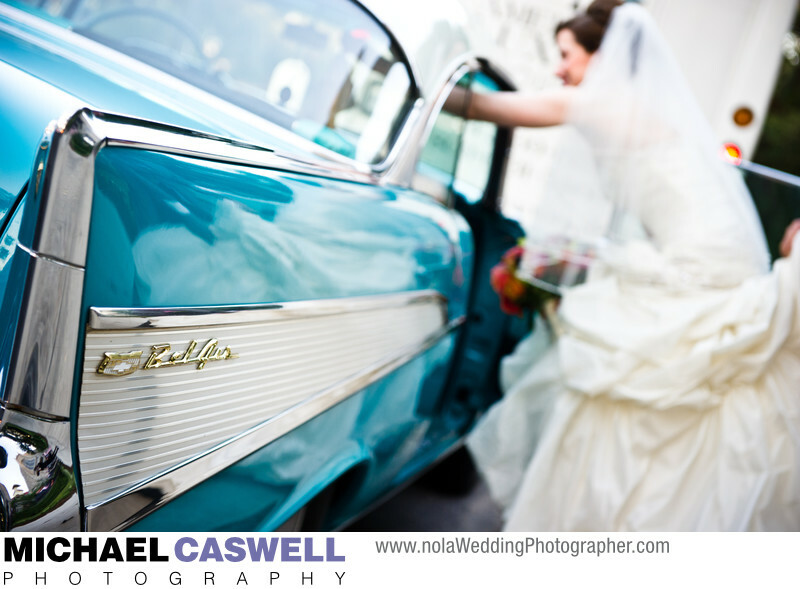 After the conclusion of their wedding ceremony at Saint Charles Avenue Presbyterian Church in uptown New Orleans, rather than be transported by a traditional chauffeured limousine or mini-bus along with the whole bridal party, the groom's friend had graciously loaned the couple this gorgeous and beautifully restored antique Chevrolet Bel-Air for the two of them to drive themselves to the reception in classic style, and I captured this interesting angle as the bride was being helped into the passenger seat by her new husband. Unfortunately, the classic car did not run quite as well as it looked, as it took a while to get the engine started (other photographs captured in this series include some of the groomsmen pretending to push the gorgeous but finicky vehicle down the street). The car did eventually start, but then the engine stalled a few times on the way to the reception at New Orleans Board of Trade on Magazine Street in the downtown area. The bride and groom eventually arrived, a little late but still cheerful despite these minor but memorable mishaps along the way. I always love when couples choose to have unconventional wedding transportation like this! Location: 1545 State St, New Orleans, LA 70118.